Industry experts say a string of high-profile restaurant closures around San Diego underscore problems in the business as the hospitality sector deals with major changes. 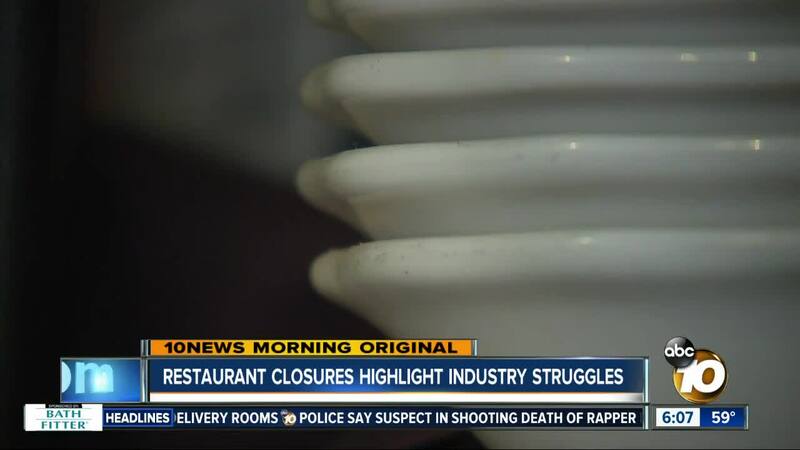 SAN DIEGO (KGTV) - A pair of recent restaurant closures are highlighting some of the struggles owners are facing as the industry grapples with major shifts in the way it does business. Last month, Brooklyn Girl in Mission Hills and Urban Solace in North Park both closed their doors. Facebook posts thanked long-time customers but gave few answers as to why. Industry experts think it's a sign of bigger problems in the hospitality sector, as rising costs and changes in people's behavior are combining in a "perfect storm" of problems. "These are seasoned operators, people who have been in business for a long time. And for one reason or another they're just stumped," says Stephen Zolezzi, the President and CEO of the Food and Beverage Association of San Diego. His association tracks the total number of licenses given out in San Diego to food and beverage vendors. Zolezzi says over the last three years, there's been an increase of 300 licenses. While that may make it seem like the industry is growing, Zolezzi sees it differently. "Previous years, we've seen increases of 1,000 or 2,000 licenses," he says. Zolezzi says the cost to operate a restaurant is becoming too expensive to manage. The prices of rent, insurance, and goods have all gone up in the past year. There are also higher labor costs because of minimum wage hikes and low unemployment creating favorable hiring conditions for employees. But cost isn't the only factor. "Customer loyalty, today, is really at a low," says Zolezzi. His members say diners now would rather go to multiple places once than become regular, dependable customers at a few spots. "You could be doing everything right," he says. "Great food, great service, great value; but the customers just move on because there's something else." Another factor is the rise of delivery apps like GrubHub, DoorDash and Postmates. Zolezzi says these apps can charge restaurants as much as 30% of the total bill, plus delivery fees, to carry their food. That cuts into already razor-thin margins and in some cases cause restaurants to lose money on each delivery order. "If you don't have that factored into your business plan, it could create a negative," he says. Zolezzi says it's now up to the industry to adapt, as restaurant owners need to constantly reinvent their location, menu, and marketing to bring in more customers.